Are you struggling to feel a part of your parish? Do you walk into Mass only feeling like your fellow Catholics are passing acquaintances? Tried different activities with no luck? Here’s the bad news: It took me 3 years at my parish before I really felt like I belonged. The good news: I think I’ve figured out the keys to success! Get active and involved – The first step is on you; you have to make the effort and be willing to keep trying until you find the right thing. Don’t give up after your first activity or two or three or four are not a success. Keep on, keepin’ on! If I can do it for three years, so can you :). Showing up at Mass is NOT enough to get to know others. Choose small group activities – You are not likely to get to know people well by attending big events like parish missions, Mass or even being one of 100 Eucharistic ministers. While these are all wonderful — and Mass, critical — things to participate in, they are not necessarily the activities that lend themselves to making friends. Select intimate book groups, small committees, small group outings, discussion groups and Bible studies. Look for activities that require interactivity – Can you help with food prep for the Seder Meal where you’ll interact with others in the kitchen, go on a volunteer outing to the local food pantry, participate in a study group that requires discussion? This is how you’ll start to become more than just a face to these people. Go on a retreat – If your parish has a retreat, such as Christ Renews His Parish, DO IT! Over a retreat, where you spend many hours with the same folks, you’ll develop a rapport and special camaraderie with some (not all) of the attendees. I highly recommend Christ Renews His Parish (CRHP) specifically, which has an ongoing component after the retreat. CRHP is designed to give you a group of people that you get to know REALLY well and whom you can count on to be a support group for you within your parish. CRHP is not available at all parishes but inquire if it is available at yours. Learn people’s names – Once you meet someone, make an effort to commit their name to memory. Whenever you see them or give them peace at Mass, USE THEIR NAME. Make a point to ask them how they are doing, or how the weather is treating them, or how their kids are getting along in school. Continue to break the ice until it’s broken! Plus, everyone likes to hear their own name 🙂 (that’s an old Dale Carnegie trick). Now, with those tips in mind, I’m going to tell you how it all finally turned around for me. Once I became interested in Catholicism several years ago, I began going to daily Mass quite often. I saw the same people over and over but never got to know them, because Mass is just not the place for chit-chat or in-depth discussions. Last Lent, thanks be to God, it all changed. The wonderful Catholic evangelist Hector Molina led our parish mission. I was SO excited, having heard him on Catholic Answers on EWTN radio, that I wanted to attend everything he participated in. While he was visiting, he agreed to attend coffee after daily Mass to socialize with any interested parishioners, so you’d better bet I was there everyday. This ended up being only a small group of about 8-10 people (what a shame that so many missed out on his wisdom), and through these intimate, one-on-one discussions with Hector, where we all asked deeply personal and nagging questions about Catholicism, the ice broke. Suddenly, I had 8-10 new people I knew by name and knew something about them personally! Around this same time, a woman who worked for our parish, whom I knew in passing because we had children the same age, invited me to coffee to ask for some public relations advice, since that is my profession. In meeting with her, I offered my time to help with several projects she had going on at church and as a result of those, met a few women, who I also could call by name. I also finally signed up to participate in CRHP that Lenten season, and that was the final turning point. Not only did I get to know the personal stories of the women leading the retreat, but I met 8 other wonderful women who attended with me. We continued to meet weekly for a long while and now meet every so often but I continue to interact with many of them on a more frequent basis. Now I feel comfortable enough to call on them for anything I need, to ask them to meet for coffee or just to ask advice or lend an ear. Another great activity I joined last fall was an educational study where we weekly watched the video series Epic on early Church history, and then broke into small groups to discuss afterward. This is the most like-minded group I’ve found within my church to date and is the activity I most look forward to. More friends made :). I’ve also gotten involved with RCIA and gotten to know that team of parishioners and many new Catholics, as well as agreed to teach 5th/6th grade religious education class where I’ve met yet another amazing woman who co-teaches with me. Now, I have the problem of being asked to help out more often than I can, but I’ll take that any day. And I know SO many people at Church. This, literally, all in the course of a year. You can do it, too! I must point out that over those three years, I signed up for many things at church that just were not a fit for me. Please know it’s OK to realize something just doesn’t work and move on to something else. You will hit upon the right thing eventually and the dividends will be marvelous! What tips do you guys have for getting involved at your parish? How did you do it? What didn’t work? I love to read! But these days I tend to engross myself in nonfiction books, mostly related to Catholicism, theology and religion. Sometimes, though, my brain needs a break from all the heavy stuff with a light and pleasant read. The holidays can be a perfect time for this type of reading if the rest of life is already overwhelming your brain. I’ve got two new books to recommend that are just perfect for grabbing a soft blanket, curling up on a rainy or snowy day and jumping into the beautiful simplicity of these stories. These are books you won’t want to put down. “Five Years in Heaven” is a memoir of a young professional’s relationship with a 90+-year-old nun in Pennsylvania. Schlimm shares how he met Sister Augustine, who runs a ceramics shop at a 150-year-old convent where he lived, and began a five-year dialogue with her that led him to sort out God’s direction for his life, learning valuable lessons along the way. As St. Teresa of Avila says, “God is in the pots and pans,” so He is in this simple story. While I am no artist and know nothing about ceramics, I absolutely delighted in the descriptions of how Sister Augustine created these little works of art that ended up bringing so much joy to so many. From her fingers molding the clay to firing them in the kiln to her gentle strokes of paint, God is in the details here. I could have read on and on about the beauty that came from her creations and from her gift of self to this young man. It’s truly a delight and covers several Christmas seasons, making it a lovely Advent treat. 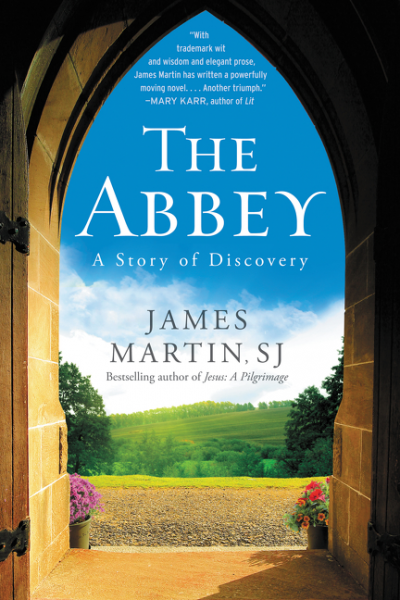 The Abbey is a fiction tale that came to Martin in a dream. Martin is a Jesuit priest and New York Times bestselling author of Jesus: A Pilgrimage and The Jesuit Guide to (Almost) Everything, as well as editor at large of America magazine. I love anything about a convent or monastery, as I’m fascinated with how they live their days focused on prayer and work — and all the difficulties that must come with living in community. This story follows the intersection of the lives of three people — a single man, a divorced mother whose son died as a teenager and the abbot of a monastery, also in Pennsylvania. This is a wonderful story of love, loss and finding one’s place in religion lived out in three very different ways. I think we can all find ourselves in one of these characters, relating to their struggles and their attempts to find peace in life. I finished this book in a matter of days and found myself anxious to know what happens to these characters next. It’s always the mark of a good book when you are sad for it to end :). The Abbey reminds me of the Mitford Series by Jan Karon, which followed the simple lives of an Episcopal rector in small town North Carolina. Enjoyable, easy, inspirational reading. Get your Christmas reading in order now so when you need a break from the busy-ness, you’ll have handy a copy of one of these works to put yourself in another place and time. 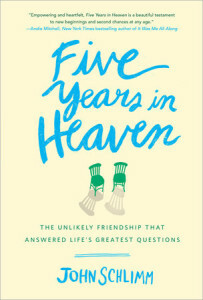 Note: I received a copy of “Five Years in Heaven” from Blogging for Books and a copy of “The Abbey” from HarperOne for this review. Did you know there’s quite a lot of amazing Catholic books, tools and more that are waiting for you to order them at either no cost or for a very small shipping fee or donation? These are amazing tools that just might be what you need to light the spark in your faith if it’s started to dim or to make it burn even brighter. 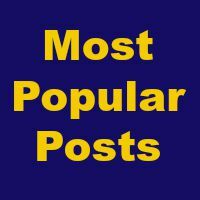 I’ve stumbled across many of these over the last few years and here are some of my absolute favorites. Go order them for yourselves right now! 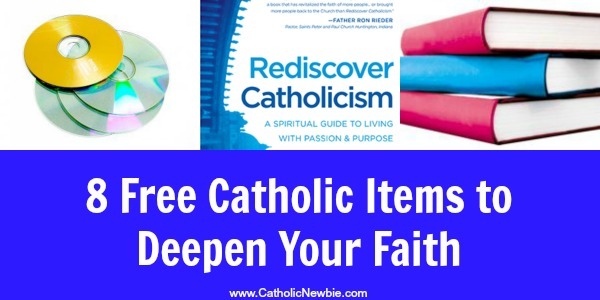 1) Rediscovering Catholicism – Matthew Kelly and his DynamicCatholic.com organization offer tons of free books and resources on their website. But my favorite is his original book on Catholicism, Rediscovering Catholicism. This is what helped me early on understand Catholicism and its relevance in light of our society today. EVERYONE should read this book. It will bring your faith to life for you! Order here + $5.95 shipping & handling. 2) The Rosary and Divine Chaplet on CD – The easiest way to start praying the rosary is to order this CD and stick it in your car. Pray whenever you have quiet drive time. If you don’t yet know how to pray the rosary, this is the easiest way to learn. They pray it for you and you can either just listen to them or repeat back as you begin to learn the prayers. Order it here for just a $1 donation. Here are more ideas for fitting the rosary into your busy day. 3) Total Consecration to Jesus Through Mary materials – Read my blog on Total Consecration (a process I highly recommend) and if you decide you feel called to make this commitment to Mary, order free materials to help you through process from MyConsecration.org. This practice, made popular by St. Louis de Monfort and Pope John Paul II, can be completed in several ways. If you’re interested in the more classic, prayer-filled preparation from St. Louis de Monfort, order those materials free here. If you’re interested in a more modern interpretation and requires less time, order 33 Days to Morning Glory by Fr. Michael Gaitley for free. 4) Flame of Love – Similar to St. Faustina’s visions of Jesus and subsequent diary, Flame of Love written by Elizabeth Kindelmann shares messages she says she received between 1961 and 1982 from both Jesus and Marty. They are similar to those of St. Faustina and other approved Marian messages around the world. Order your free copy of her book. At the National Congress of The Flame of Love of the Immaculate Heart of Mary movement in Budapest, Hungary, June 6, 2009, Cardinal Peter Erdo, Archbishop President of Esztergom-Budapest, Hungary and President, Council of Episcopal Conferences in Europe, gave the text his Imprimatur. 5) Mass Journal – Another great free tool offered by DynamicCatholic.com is a mass journal. Bring this notebook with you to mass and write down any messages from God or thoughts that occur to you during mass, so you don’t forget. Order here + $5.95 shipping & handling. 6) The Conversion of Scott Hahn CD – I recently heard a fellow parishoner, who was a lifelong Protestant, mention this CD as key to her understanding and ultimate conversion to Catholicism. Hahn is a wonderful writer who helps explain the Catholic faith in his many books. He is a former Protestant minister turned Catholic convert. Order for just a $1 donation. 7) St. Therese Novena Prayer Card – Many Catholics have a devotion to the “Little Flower,” St. Therese of Lisieux (my confirmation saint, whom I adore). It is said if you pray her novena for a specific intention, she will send you a sign in the form of a rose. I’ve received my rose (read about my signs from St. Therese)! See if you get yours. Simply order this free St. Therese Novena Prayer Card from the Society of the Little Flower. You can also order prayer cards, even ones touched to a relic, for $.55 or less. 8) Prayer Process Cards – This is a wonderful exercise suggested by Matthew Kelly that you strive to complete daily. It encourages you to prayerfully consider your day from what messages God was speaking to you to what you could have done better to thanking God and praying for others. These cards are a simple reminder of the process to keep by your bedside, on your side table, in your prayer area or wherever. They send 20 at a time with $5.95 shipping & handling, so share with your friends! Over the weekend, I came across an article that stopped me in my tracks. 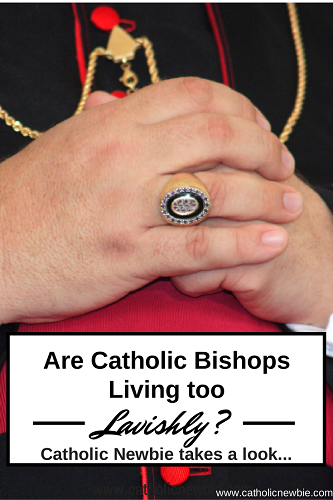 The CNN Belief blog lists the residences of many of America’s prominent Catholic bishops, noting their size and value, which they define as “lavish.” It made me think about the morality of how a bishop should live. But because this CNN article was not from the Catholic Church, rather from secular media, I knew there had to be more than meets the eye, so I asked some lay folks, priests, well-known Catholic personalities and Catholic authors to weigh in along with my thoughts. Patti Armstrong, a prominent Catholic writer and author, noted that while the article pointed out the size and value of these residences, it did not consider HOW the bishops live in these residences. It is quite likely that they live humbly within the walls. “People are judging by the building,” she said. “No one has been able to point to opulent living. You can’t judge by the cover and a house is just a cover.” She notes that St. Thomas Moore was a martyr whose position with King Henry VIII afforded him luxurious living. “The residence that comes with a position does not indicate necessarily how one lives,” she said. Additionally, these residences are not the bishops’ personal homes but rather belong to the diocese. There is also the issue of the importance and magnificence of some of these buildings. Just as the Vatican holds a treasury of incredible artwork, written works, gorgeous historic cathedrals and ancient “lavish” artifacts, so may some of these American cathedrals and structures be historically or architecturally significant – now or down the line. “Imagine if all of the Vatican treasures had been sold off, all that history,” said Armstrong. “There would be nothing for us to see today.” In caring for these buildings, opening them for public use and appreciation, and passing them down from bishop to bishop from priest to priest and from parish to parish, the Church is being a good steward of precious possessions. After all, if we are judging things by size and value, the size of St. Peter’s is several football fields and contains priceless works of art and no one thinks that should be sold! Teresa Tomeo, host of Catholic Connection on EWTN radio and popular Catholic author, noted, “A lot of these homes have been in the various dioceses for decades or even longer and are attached or very close to the cathedrals.” A great article over at CatholicVote.com also notes that many of these residences were built over a century ago so the church is not paying mortgages. They also write that many of the buildings written about in the article are in some of the largest metropolitan areas with the highest property values. But what about the newer homes built specifically for these bishops? “Many have been donated or built by the people and most are used as places for other clergy to stay when they come to town,” said Tomeo. The need for meeting space and accommodations for overnight guests is another reason for the size of some of these residences. Many may house several priests or even staff in addition to the bishop. The argument can also be made that bishops must entertain prominent individuals who might not be accustomed to such humble surroundings as dictated by the Catholic Church. While that may be the case, would anyone, even royalty, have demanded that Mother Teresa meet them in a more lush space? Father Christopher Roberts of the Lafayette, Ind., diocese and blogger at For Christ and the Church also noted that “The Church has always tried to engage the world in order to convert it,” and that, in fact, Peter and Paul went to Rome for that reason. “Sharing the Gospel in the modern world will often mean the Church has to adopt modern business practices and technology.” But the question is, to what extent? All excess should be set aside for the good of the Church or works of charity. They should avoid all greediness. They should carefully abstain from every appearance of business. Let them arrange their homes so that they might not appear unapproachable to anyone. I think we need to view this from the perspective of not how big is the rectory and how much is it worth, but how are the bishops “addressing their affections,” or in other words, what is their intention in having these large, valuable properties? Where is their heart? If their intentions are to serve Christ and they believe this is the most effective means of doing so, then they are following His directive and living out His Word. If they are being tempted into luxury and greed or attracted to worldly things to maintain such properties and they could carry out their tasks without these items, they are not. But this is next to impossible for an outsider, especially secular media, to know, and we can be certain we will be judged by the same measure with which we judge others. Who among us is not attached to worldly goods? One important lesson I see is remembering that the Church is not perfect, as it’s made up of imperfect humans – priests, bishops, lay people, nuns, monks, deacons – in a fallen world and has done wrong in the past, as have we all. It does not hurt to take a close look at what the Church is doing to look for ways to improve. This is an area, in my humble opinion, where I believe the Church can probably do better. I’m sure there are many cases where maintaining a more valuable, large rectory is warranted and the most efficient means of pastoring a flock, but I’m also sure there are cases where it is not. Let’s all challenge ourselves as followers of Jesus, with our bishops, to more closely follow the narrow path to which Christ has called us and look at the intentions of our hearts when it comes to worldly goods. Where it’s possible, let’s downsize and give, not just out of our abundance, but out of our need like the widow. Jesus told the rich man – and the apostles – to give away everything and follow Him. The Church is not perfect, but it can strive to be, as Jesus calls us, and in following Pope Francis’ lead. As Father Roberts said, “I admire Cardinal Sean O’Malley’s decision to live at the Cathedral Rectory in Boston. I hope more bishops, priests and lay people follow his lead.” Me, too. Note: I reached out to the United States Conference of Catholic Bishops to see if they had an official response to this CNN article. They did respond, saying they did not.